기사요약: 북한의 핵위협이 높아짐에 따라 안보협력을 강화하기로 다짐했다. 문재인 대통령은 최근 방한한 도널드 트럼프 미국 대통령과의 정상회담 이후 가진 기자회견에서 북핵 문제에 대한 평화적 해결에 대해 한미가 합의했으며, 군사협력 강화에 뜻을 같이 했다고 전했다. South Korea and the US will cooperate on “an unprecedented level” to strengthen Seoul’s military capabilities, President Moon Jae-in on Tuesday. 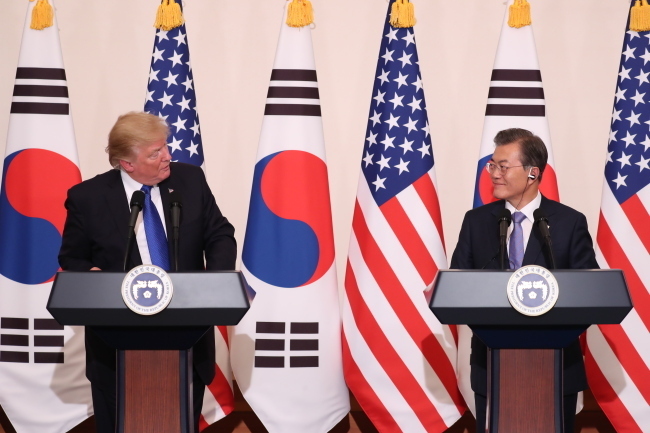 Speaking after a summit meeting with US President Donald Trump in Seoul, Moon said that the two countries will immediately begin talks regarding Seoul’s plans to purchase or develop cutting-edge military assets. “We agreed to resolve North Korean nuclear issue peacefully, and to establish permanent peace on the Korean Peninsula,” Moon said at a joint press conference at Cheong Wa Dae, the presidential office. 기사요약: 그룹 세븐틴이 최근 2번째 정규앨범 "Teen, Age"를 내며 컴백했다. 13인조인 세븐틴은 앨범의 타이틀 곡 "박수(Clap)"을 통해 풋풋한 소년같은 과거의 모습을 뒤로 하고 더욱 성숙해진 모습을 보여주고 있다. Leading the group into a new direction, Seventeen’s new single “clap,” a lead track off its second full-length album “Teen, Age,” was an announcement to the world that gone are the good old days of boyishness of the 13-piece group. Two years into its career, K-pop rookie Seventeen returned Monday with its second full-length album, where all 13 tracks were composed and written by the members. The group released its first full-length album “Love & Letter” in April last year. “Teen, Age,” which was released via local streaming sites at 6 p.m. on Monday, is fronted by “clap,” a mix of blues-rock and funky sounds. As the title implies, the members said that they wanted to send a round of applause to themselves for having wrapped up the group’s first part of its activities, as well as celebrating its maturity with the new album.